Petrobras used to be the crown jewel of Brazil. Now it's a symbol for the country's rapid decline. Not only is the oil giant the epicenter of a massive corruption scandal, it's the focal point of short sellers on Wall Street who believe its shares will continue to crumble. The scandal may also force Petrobras (PBR) to take huge writedowns on the value of assets that may have been inflated. Petrobras has also been slammed by Brazil's plummeting currency as well as the dramatic plunge in oil prices, which has made its expensive deepwater drilling projects uneconomical. No wonder why short sellers are circling Petobras. Short sellers borrow and then sell shares, betting they can buy them back later at a cheaper price -- and pocket the difference. Petrobas came in as No. 1 on SunGard's Astec Analytics weekly ranking of securities lending statistics. The firm said borrowing of Petrobras shares has doubled in the past two weeks alone, signaling short selling activity has been ramping up. 3D Systems: People who bought 3D Systems (DDD) stock back in early 2014 wish they could print out a new stock chart. The real one hasn't been pretty. The printer maker has plummeted an eye-popping 71% to just $28 over that span as enthusiasm for the company got out of whack with fundamentals. This favorite of short sellers is drawing more attention in recent weeks as its shares bounce off recent lows. The cost of borrowing has nearly doubled over the past two weeks, Astec says. "3-D printing is alive and well -- just not in this stock," said Brad Lamensdorf, a portfolio manager who helps run the AdvisorShares Ranger Equity Bear ETF (HDGE). Lamensdorf's fund has been short 3D Systems since it was trading at $75. "We think there's another very large shoe to drop in this stock," he said. 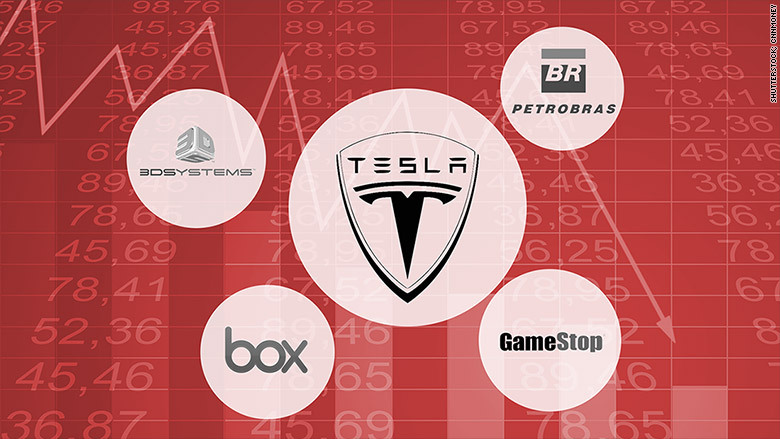 Tesla Motors: Wall Street has a love-hate relationship with Elon Musk's electric car company. The incredible potential of Tesla Motors (TSLA) was highlighted last week when the company revealed a 55% surge in Model S sales. The news sent Tesla's shares surging. However, Tesla is in the red on the year and is still 29% below recent highs amid concerns about valuation and rapidly rising inventories. Only 55% of Wall Street analysts -- a rather optimistic group of people -- have a bullish rating on Tesla, according to FactSet Research. Tesla has also run into trouble in China, where the company recently cut 30% of its staff due to problems in the world's largest market for car sales. Astec says security lending numbers suggest short selling in Tesla has been "growing steadily" since early February, with the number of shares borrowed soaring 24%. Box: The warm welcome to Wall Street for Box (BOX) appears to be over. The digital cloud storage company is now trading at $17, below its debut price of $20.20 and edging closer to its IPO price of $14. Box has been knocked for its slowing growth and high spending. It doesn't help that Box is posting losses and profitability is nowhere in sight. Box, which is like the business-friendly version of DropBox, plunged in mid-March after revealing a deeper fourth-quarter loss. Astec says the cost of borrowing Box shares stands at a lofty 62%, though that's down from 87% previously. Related: Fewer people are loving stocks now. Buy signal? GameStop: The video game retailer was one of the worst performers in the entire S&P 500 in 2014. This year started red hot for GameStop (GME) but short sellers think that game is over. Shares of GameStop have cooled off a bit recently after saying holiday sales declined more than Wall Street had been anticipating.